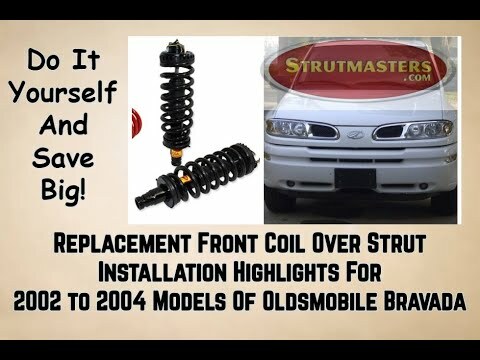 Strutmasters 2002-2004 Oldsmobile Bravada Rear Air Suspension Conversion Kit With Shocks is the perfect solution to your air suspension problems. Designed to be very affordable, you can convert your air suspension to use passive shocks and coil springs for less than the price of replacing Original Equipment air springs. Will Not Fit SS Models. For Standard Models Only. 2002-2004 Oldsmobile Bravada Rear Air Suspension Conversion Kit With Shocks GB1RB is the perfect solution to your air suspension problems. Designed to be very affordable, you can convert your air suspension to use standard. The air suspension system on the 2002-2004 Oldsmobile Bravada is made up of assorted parts that must always function in sync. When one part goes, the system stops working. This dependency is expensive and inconvenient. The Strutmasters air to non-air suspension conversion kit eliminates this all-too-common dilemma for good. This kit, manufactured in America, includes two cold-wound steel Eibach coil springs and two shocks tuned just for the rear of the Bravada. Car enthusiasts will appreciate that the kit is installed in as little as one hour per wheel. Detailed installation instructions and installation videos available online help eliminate frustration and save time. For our customers, Strutmasters' ASE certified technicians are available to you or your installer for any questions or install advice. But it's the low price of the kit that seals the deal when customers are choosing between an air replacement and non-air suspension conversion kit. 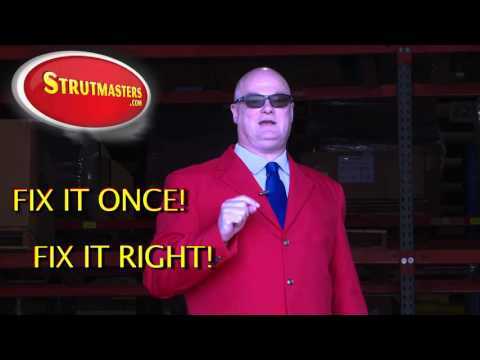 Review these three prices before making a decision: that of repairing the air suspension system with Original Equipment parts at the GM dealership; that of installing aftermarket air replacement parts individually; and that of installing a brand new Strutmasters rear suspension conversion kit. Get your ride fixed without ever having to visit the dealer. 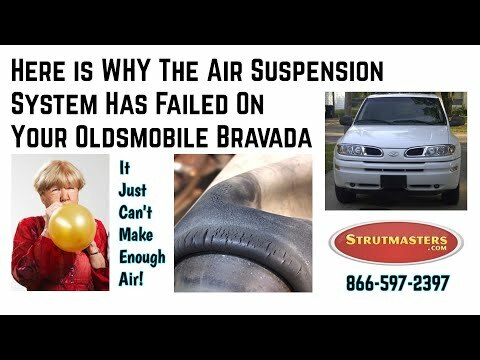 How Do I know If My Bravada Air Suspension is failing? Look for these common signs of a failed or leaking air suspension system in the 2002-2004 Oldsmobile Bravada. If left unchecked, a bad air suspension system can wear out other vehicle components, resulting in total failure. The most noticeable sign to look for is a sudden three to five inch drop in the rear of the Bravada. Many drivers notice a slight lean from one side to the other. If the Bravada is having any issues with reaching its proper ride height, suspension failure is the most likely cause. Listen to the air compressor- has it stopped working? Is it running too often (noticeably noisy)? These are also bad suspension indicators. Lastly, check the dashboard. If there is an illuminated suspension warning light, it's safe to assume you'll be needing a suspension repair or direct replacement. = TOTAL: Over $900 (and that still doesn't include replacing electronic components that are known to fail such as the height sensors). + Air Compressor and Dryer Assembly ($110) + Rear Air Springs ($130/spring) + Rear Shocks ($40/shock) = TOTAL: Over $450 (and that still doesn‚Äôt include replacing electronic components that are known to fail such as the height sensors). 2002-2004 Oldsmobile Bravada Air Springs (x2)- commonly referred to as air bags, a plastic and rubber bag that uses pressurized air as a cushion to support the weight of the vehicle. As a replacement for traditional metal coil springs, the factory rubber air springs are the number one cause of all air suspension leaks. Since all air springs go bad at about the same rate, if one is leaking, the others will not be far behind. For a proper repair, all of them need to be replaced at the same time. 2002-2004 Oldsmobile Bravada Shock Absorbers (x2)- these control the wheel-to-ground contact for the rear of this vehicle. Shocks dampen vibration and bounciness caused by rough road conditions. 2002-2004 Oldsmobile Bravada Height Sensors (x2)- a linkage located near each wheel of a vehicle with any electronic suspension that, either mechanically or electronically, constantly measures the height of the vehicle, and reports this information back to the control module so that the computer can identify if changes in height need to be adjusted accordingly. The ride height sensor is a moving part, and like all moving parts, they will eventually wear out. 2002-2004 Oldsmobile Bravada Air Lines- tubes that run from a compressor to the air which carry pressurized air to the air bags in order to adjust the height of the vehicle, respectively. 2002-2004 Oldsmobile Bravada Solenoids (x2)- these plastic components work along with the suspension control module on vehicles with active suspension. The solenoid regulates the air pressure for each air spring. Solenoids start to leak as they wear out causing the vehicle to sag or to lean. This will cause the ride height sensor to send a signal to activate the compressor in an attempt to inflate the air suspension and level out the vehicle. This excessive work load will eventually lead to total failure of the compressor. Compressor Assembly- creates/sends pressurized to active suspension components. When the air suspension starts leaking, the compressor/pump starts working harder to try to keep the system inflated. By the time air suspension leaks down completely, sitting the vehicle on its tires, the compressor will either have failed or be well on its way to full failure. 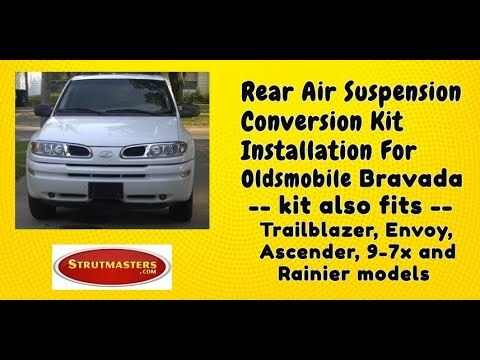 2002-2004 Oldsmobile Bravada Dryer- prevents moisture build-up inside of air suspension parts. 2002-2004 Oldsmobile Bravada Suspension Control Module- a computer which is responsible for the operations of the air suspension system and maintaining the vehicle's correct ride height. 2002-2004 Oldsmobile Bravada O-rings- Although they are the least expensive parts of the air suspension, they are responsible for maintaining the seal where all of the air lines connect. Be sure to replace the O-rings when repairing any air suspension system. Ordered this kit rather than new air springs due to the relatively foolproof installation process. Videos were extremely helpful. This can even be done without removing the wheels, using common shop tools. My Bravada rides like a dream and passengers would never suspect the car has been converted. Darrell provided excellent customer service and ensured my order would arrive by a certain date (it even arrived a day early!). A bit pricier than the competition’s kits, but these parts seem of utmost quality. No issues with the ECAS dash warning light. Would definitely recommend this kit for anyone looking to save $500+ at the dealer. “I thought you would like to learn about another success from installing your conversion kit! This air suspension conversion kit finally eliminated the expensive and high maintenance Envoy factory air system. In less than an hour, this kit has returned the smooth factory ride (not to mention – no more low-rider, and no more noise from the air pump cycling on and off)! The air-ride system was going bad on my 06 Rainier. The compressor was good but the air-bag springs were leaking. I would come out in the morning or after work and it would be sitting very low. After starting car the bags would pump up (most of the time) and i dealt with it like this for quite some time. I decided to go with the springs after rationalizing that if i put new air springs on it, the compressor would be the next to go and then the $$ would just continue to go up. Overall ride seems quite good and certainly a nice change from waiting for the bags to pump up every time i start the car. Install was really easy. I am by no means a gear head but i did most of this work myself with the my bro-in-law supervising and assisting when needed. Right tools are the biggest need. If doing this yourself jackstands are a must as you need to keep the car up on them after you remove shocks and air-springs to let the rear suspension lower out of its ride position. Overall good economical fix.